This page lists the paintings and original prints that I have available. As I complete new paintings. I will add them to this page. The top division of th page is for original oils. These paintings are the actual painting, itself, oil on canvas stretched on heave stretchers and ready to hang on the wall. The Original prints are gelclees on canvas and over painted with the exact colors used in the originals. You can read more about this process below. This is a 24" x 48" canvas oil. The colors are as intense or a little more in the real painting. This is a true original. This painting is presently in a gallery in Napa Valley representing me. If you are interested in this painting please contact me on the Contact Me page. This is gallery wrapped meaning that the canvas is continuous from the back of the stretcher around the frame and across the painting. The painting is painted on the sides as well as the front giving it some depth and eliminating the need for a frame. Hanging this without a frame makes the subject more dominate in the room, much easier to hang because the weight of the canvas and stretch is just a few pounds and eliminates the need for a $300 to $1000 frame. This is a large oil on canvas measuring 46" x 34". We have tried this painting in several places in our home and it works in each place. At first glance, it would seem to need a special place in a house but it does not. It is amazingly versatile and makes a spectacular statement about the beauty of some of nature's creations. As with Gemini above this is a true original. Some flower art available on the net is actually a photograph enlarged and printed on canvas with a little painted added here or there. This Iris is a true original. This Iris was painted on a blank stretched canvas. When this painting is seen as a photo on a website page like this it seems to be photographic. Realism is my style. It allows the best possible view of the amazing details and beauty of a flower such as the iris. This flower grows in our garden is only about six inches high. 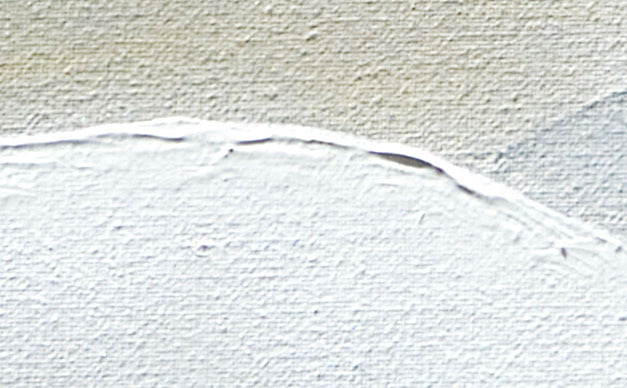 This painting represents a magnification of about eight. This really is a bee's eye view of a very beautiful flower. 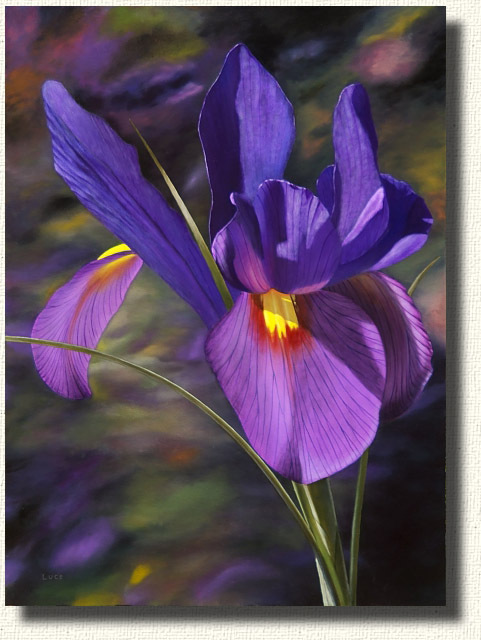 If you are interested in this Iris Painting please contact me through the Contact Me page. All of my prints are giclees. 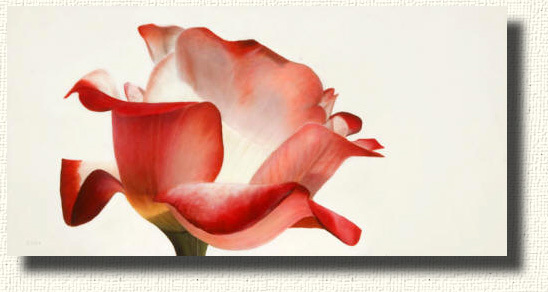 A giclee is a printing process using large, specialized, printers printing at high resolution on a heavy artist's canvas. The giclee printing process can vary as much as any printing process - maybe more. When I prepare for a giclee the first thing I do is take a very high resolution photograph of the original painting. The resolution is usually 300 DPI for a 24" x 48" painting. The detail photo to the left is very small area of the actual photo of the original Double Delight painting. The area of this detail is shown in the red rectangle in the Double Delight painting below. This photo is used by a printer that can print this same resolution on canvas. The print (giclee) has the same resolution as the input photo. The result is a high resolution, color print on canvas that is 24" x 48" - the same size as the original. 300 DPI (Dots Per Inch) prints and printers are expensive but produce extremely accurate prints for color, detail, and overall quality. The finished print - the giclee - is then stretched and mounted on stretcher bars just like an original. I then paint the giclee canvas with the original pigments I used with the original painting since I know the pigments I used intimately. I then varnish the print to protect and preserve the painted surface. When I am done, I have a hand painted print and it is very difficult to tell the original from the painting. I have been in a gallery and had a visitor argue with me that my giclee was actually an original. The giclee was on exhibit, and was shown and marked as a giclee, but the visitor truly thought it was an original. All of this is to explain to you how accurate and detailed my giclees are. On that point, I clearly mark my giclees as a prints and give the prints a limited edition number. That is why I call my prints "original prints". Each print is repainted by me and is part of a limited edition, signed, print edition. Since I paint each print, and each print is different, much like an etching edition, they are original prints. I will never sell a print as an original painting. All my prints are marked with an edition number and I sign the prints, personally, one at a time. Prints of this type run from $500 to $1500. This is the high resolution print I mentioned above. The red box is the area of the original photograph shown in the image above. This image is a low quality image used for websites but the actual print is of the quality of the inset. This print is 24" x 48" gallery wrapped on heave stretchers. the print is over painted by the same pigments I used in the original. The quality of this print is so high it could be placed next to the original and most people could not tell the difference. This is another print produced in the same process that I described above. This print is 36" x 36". Once I mount the print in stretcher bars, I repaint the image with the same pigments I used in the original. I actually enjoy the repaint process because each print is different and it is a little like painting the rose again. This is a young bloom from our garden. The rose is called Honor. Honor, in its early stage, is galactic in its shape. Later the open and flowing petals lose the shape in this bloom stage. 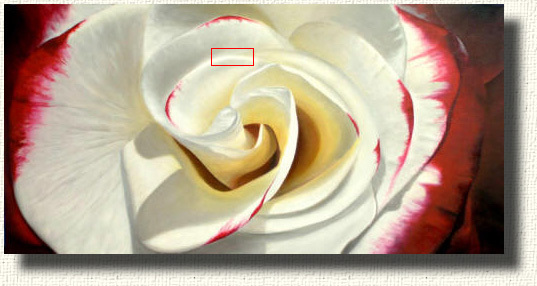 When I over paint a print I will sometimes shift the color of the heart of the rose. In this version I used the orange shades of the pigment. In other versions of this print, I have moved to the reds and pinks and sometimes I use flesh tones. We have loaned this print to friends and it seems to do well in any room. 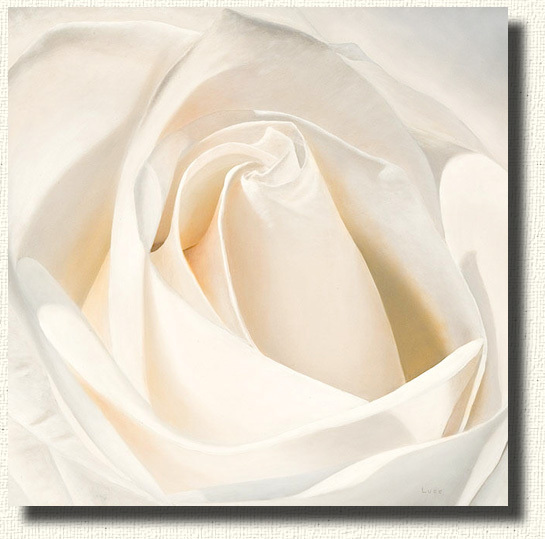 The white roses look good in almost any type of home and on most walls. 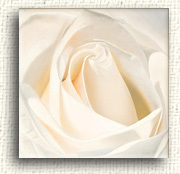 I am working on two new rose paintings but it is too early to show results - more in a week or so!